They might have been wearing marine uniforms, but they conducted themselves as soldiers (members of the Army). I watched marine recruits training, growing up in the San Diego area, and Gomer would have never survived. 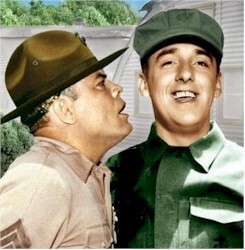 Fourteen years later I was in Army basic training (only sailors, marines, and coast guardsmen do boot camp, that involves water) and we were all Gomer Pyle. In the Marine Corps, ranks are spelled out: Frank Sutton's character would never be called Sergeant Carter. That's an E-5 buck sergeant. He would be called Gunnery Sergeant Carter and nothing less. If he is friendly with his men they might call him "Gunny." I don't think Pyle and Carter were that friendly. Now in the Army, anyone between an E-5 sergeant and an E-8 master sergeant is called Sergeant. First Sergeants are called First Sergeant and Sergeants Major are called Sergeant Major. It took me all of one day in Navy bootcamp to realize Gomer never would have lived if he'd gone to war.